OK. Thanksgiving is heavy on my brain right now. Monday was all about the sinfully delicious Chocolate Pumpkin Pie. After the brief intermission where you met my new little fur ball yesterday, now I am afraid it is going to be all Thanksgiving all the time here for a while! In our family we are salad eaters. (I mean the family I was born into). I finally realized this later in life when I would make twice as much salad as anyone eats at every social event- except for when my family comes- than there is never enough. My mom must have done something right, because I have a life long love affair with salads, and I get obsessed with what a blank canvas they can be for delicious seasonal flavors. Without a doubt we always have at least 2 salads on the Thanksgiving buffet. This is an idea for a salad you could either have on Thanksgiving, or honestly as an amazing “dinner salad” (that means salad for dinner) any night. 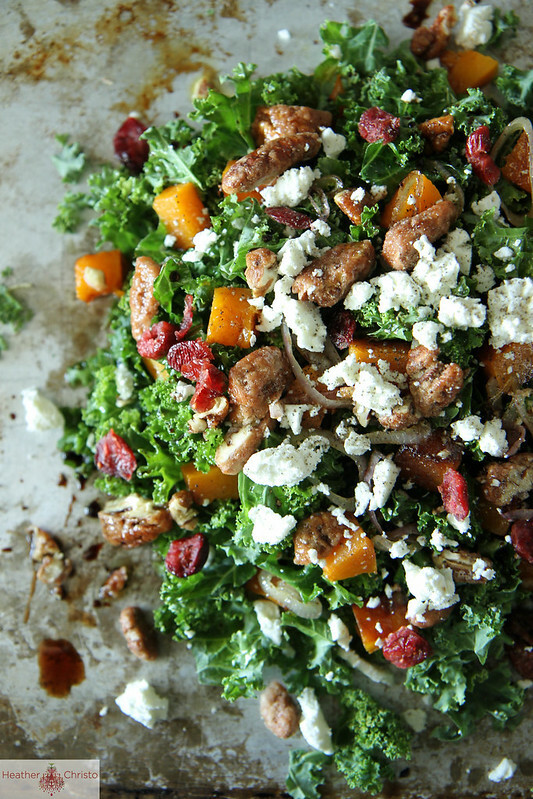 It is my favorite shredded curly kale as a base, with wonderful buttery roasted sugar pumpkin, a little creamy goat cheese, sour cranberries, sweet candied pecans and a shallot vinaigrette. It is do perfect bit by bite, and I hope you enjoy it! 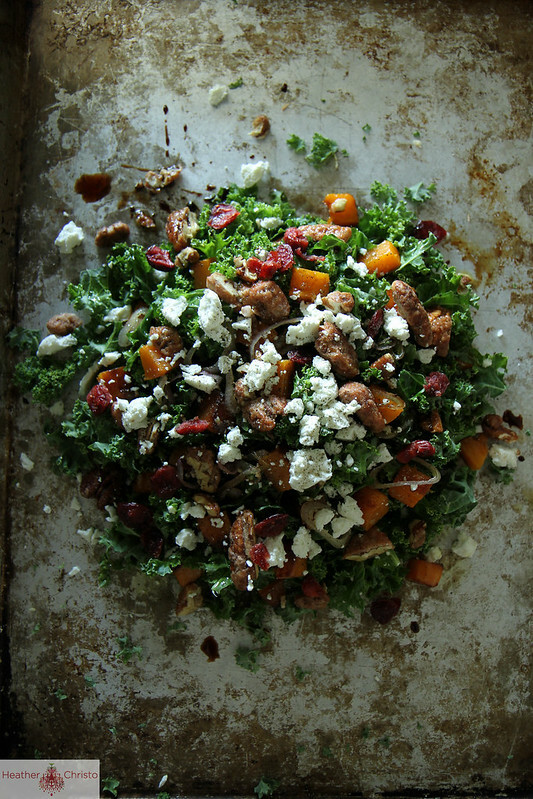 On a platter, Pile the curly kale at the base, and then sprinkle the pumpkin, goat cheese, pecans and cranberries over the top of the kale. This is so pretty, Heather!! I would love it on my Thanksgiving table! 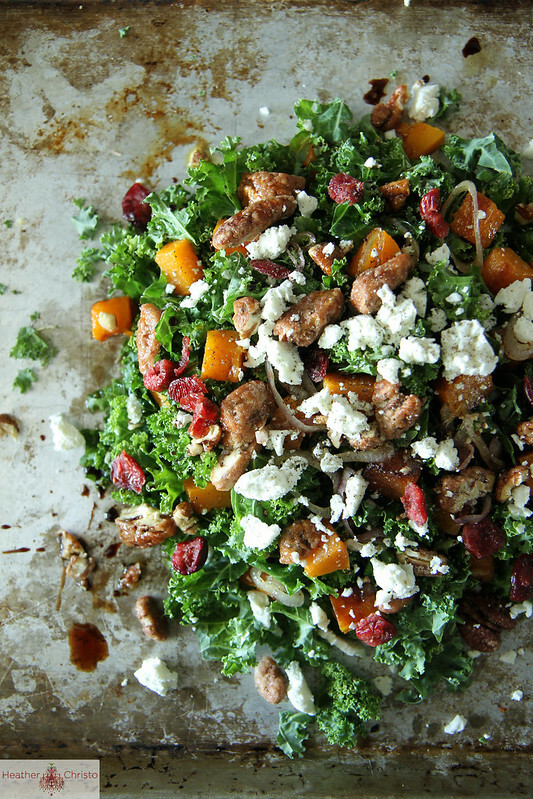 I just made a similar salad:) Great fall flavors! You are the queen of beautiful food, Heather!! I’m obsessed with salads too, what a beauty! This is pretty much my go-to kale salad, but I use a different vinaigrette…I can’t wait to try the shallot version! Pinned!! Love fall salads and this combination is irresistible. Such a tempting looking salad – wish I could have some right now! When I saw the photo of that salad, I swooned. It looks so yummy and healthy. My son, who is taking culinary classes in high school took one look at it and asked, “yeah, but does it have bacon in it?” We bought him a shirt that says ‘runs on bacon’. What a salad!! Love the pumpkin + goat cheese combo! Thanks for sharing, Heather! Ohhhhh. LOVE the look of this creative salad! Oh my! I wish I was coming to your house for Thanksgiving! Thanks for this! My 11 YO and I just baked the candied pecans for this and we’re excited about making it for Thanksgiving! Love this! Any day I can get a refreshing high nutrient salad into my body- I am all for it! Thank you!